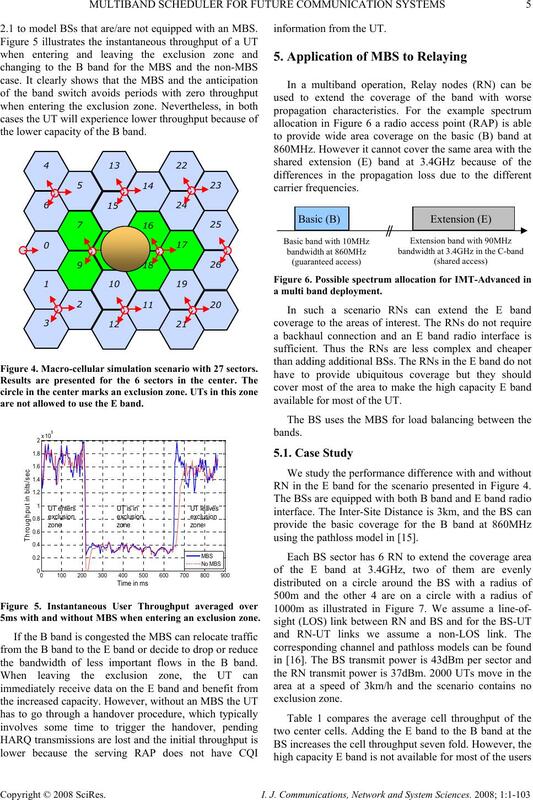 Published Online February 2008 in SciRes (http://www.SRPublishing.org/journal/ijcns/). system in the multiband mode. In particular, we propose additions to the ARQ procedures in order to achieve this. 2 K. DOPPLER ET AL. 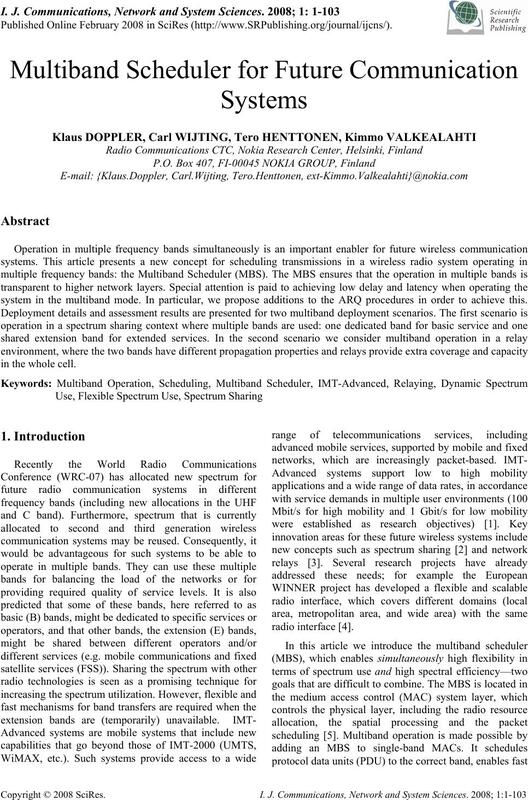 balancing the coverage area of different frequency bands. 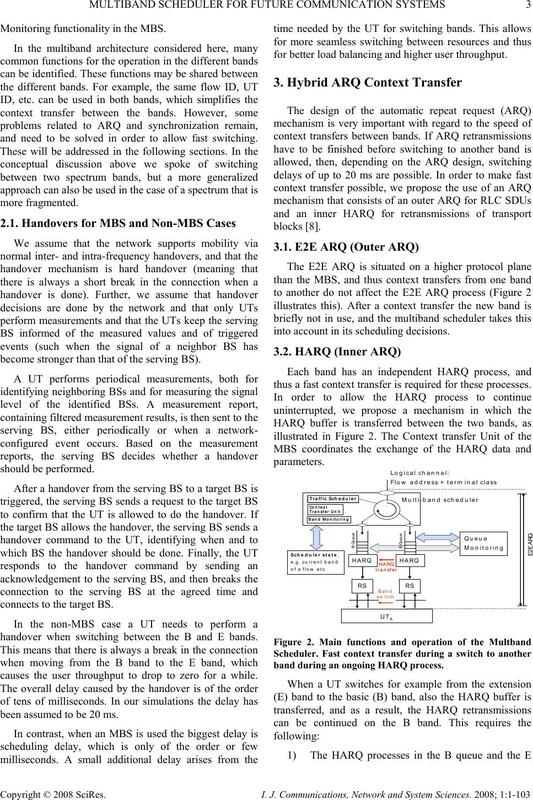 required over the air interface itself (as in 3GPP-LTE ). processing delay, leaving a margin of only 6 ms .
experience a delay of up to 3ms. data unit it is working on. more information about the TB). occurs in real time, and is transparent to the end user. Monitoring functionality in the MBS. and need to be solved in order to allow fast switching. become stronger than that of the serving BS). connects to the target BS. handover when switching between the B and E bands. causes the user throughput to drop to zero for a while. been assumed to be 20 ms.
for better load balancing and higher user throughput. into account in its scheduling decisions. thus a fast context transfer is required for these processes. band during an ongoing HARQ process. 4 K. DOPPLER ET AL. queue use a common numbering scheme. queue of the other band. before the connection on the band is actually lost. with guaranteed access can be defined . 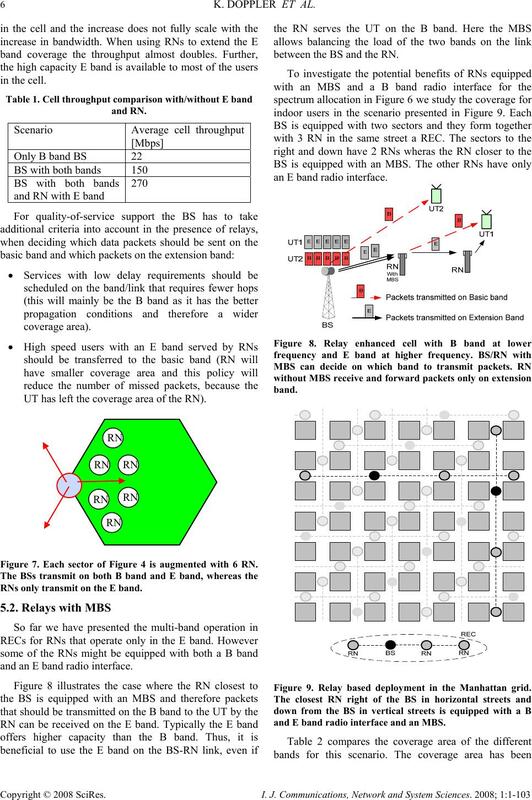 assuming that one BS handles both B and E band. band and have to switch to the B band. 2.1 to model BSs that are/are not equipped with an MBS. the lower capacity of the B band. Figure 4. Macro-cellular simulation scenario with 27 sectors. are not allowed to use the E band. 5ms with and without MBS when entering an exclusion zone. 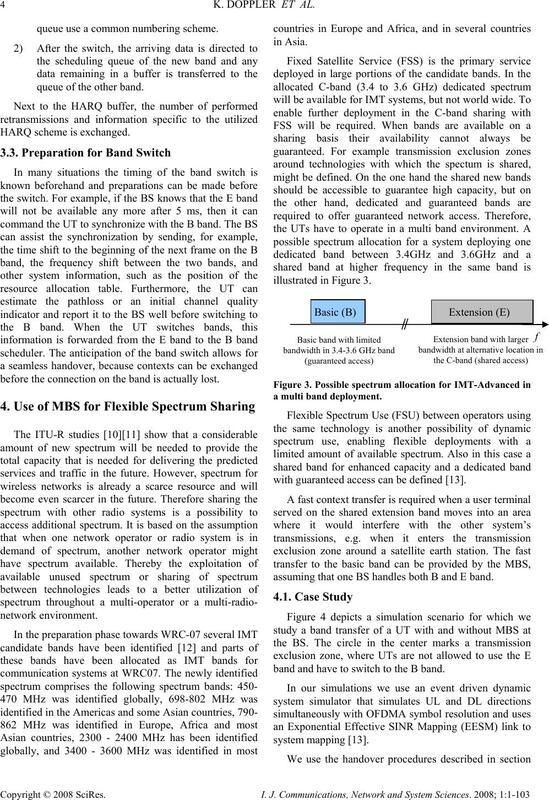 the bandwidth of less important flows in the B band. available for most of the UT. RN in the E band for the scenario presented in Figure 4.
using the pathloss model in . 6 K. DOPPLER ET AL. UT has left the coverage area of the RN). Figure 7. Each sector of Figure 4 is augmented with 6 RN. RNs only transmit on the E band. and an E band radio interface. between the BS and the RN. an E band radio interface. Figure 9. Relay based deployment in the Manhattan grid. and E band radio interface and an MBS. following the assumptions in . Table 2. Area with a spectral efficiency higher than 1bps/Hz. RN having an B band interface. 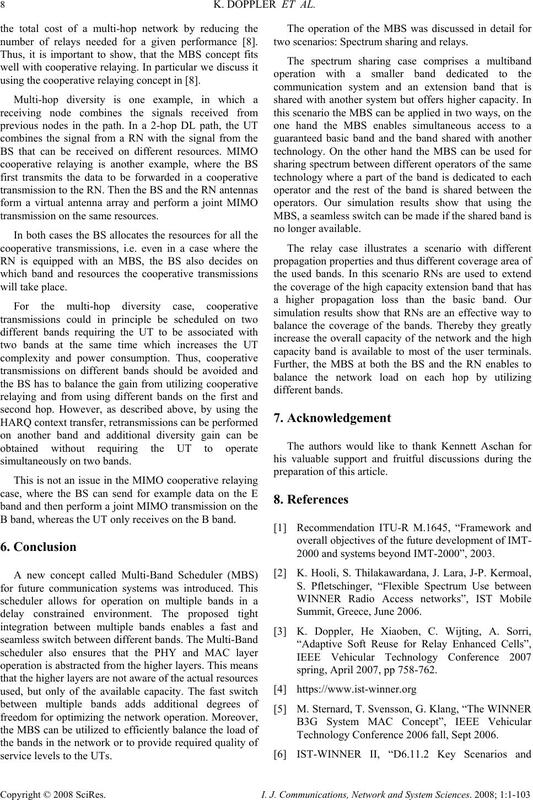 RNs with a B band interface. 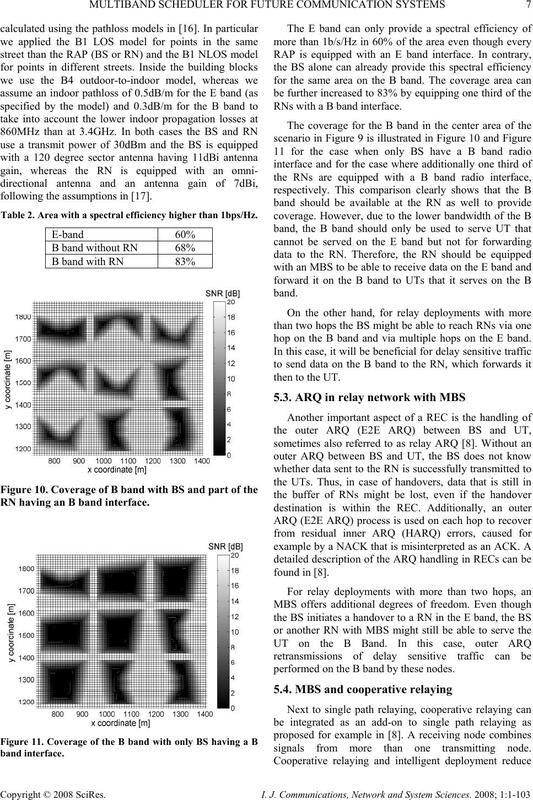 hop on the B band and via multiple hops on the E band. performed on the B band by these nodes. signals from more than one transmitting node. 8 K. DOPPLER ET AL. number of relays needed for a given performance . using the cooperative relaying concept in . transmission on the same resources. B band, whereas the UT only receives on the B band. service levels to the UTs. two scenarios: Spectrum sharing and relays. capacity band is available to most of the user terminals. 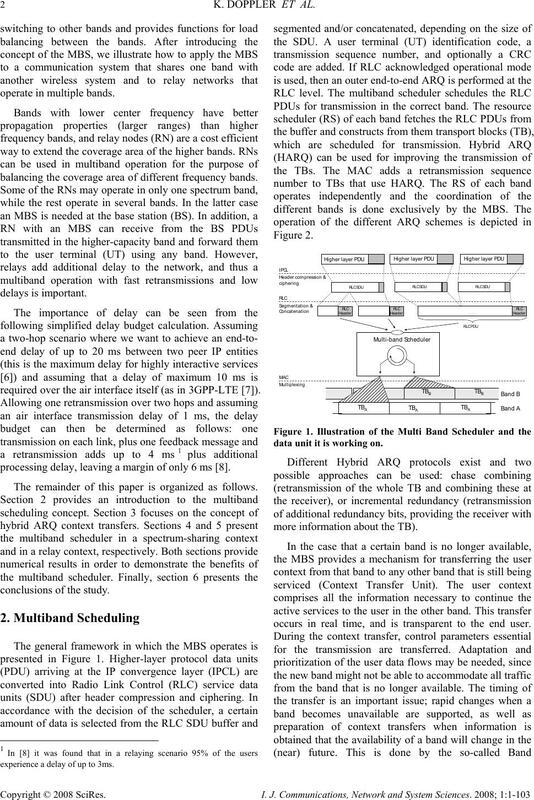 2000 and systems beyond IMT-2000”, 2003.
spring, April 2007, pp 758-762. Technology Conference 2006 fall, Sept 2006.
for Evolved UTRA (E-UTRA) (Release 7). WiCom 2007, P.R: China, Sept. 2007, pp 6738-6742. 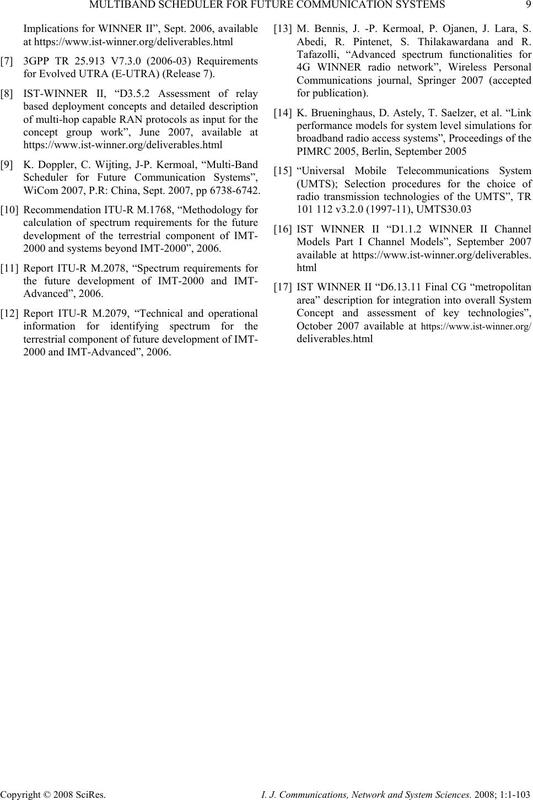 2000 and systems beyond IMT-2000”, 2006. M. Bennis, J. -P. Kermoal, P. Ojanen, J. Lara, S.
Abedi, R. Pintenet, S. Thilakawardana and R.